On June 12 of this year, the city of Orlando, Florida suffered a devastating act of violence at Pulse nightclub. It left the local community hurting and the entire nation stunned. Sam Flax and his team at Sam Flax art supply store in Orlando were left wondering how they could help. Sam came up with the idea to donate art supplies to the community. With the help of the Sam Flax staff and numerous donors, including Dynasty Brush, Sam was able to help the Orlando community through the aftermath of horrible tragedy. Artists who received donations we asked to bring in their work so it could be displayed. The artists of Orlando created over 250 pieces and the collection known as Paint Strong Orlando will now be displayed at multiple venues over the next several months. Paint Strong Orlando had its opening reception last night at the Orlando Public Library. The pieces in the Paint Strong Orlando collection will be auctioned off with the entirety of the proceeds going to help the victims of the Pulse shooting and their families. Dynasty Brush is honored to a part of this beautiful project and thanks Sam Flax and his staff for giving back to the Orlando community in such a meaningful way. Do you want to see Paint Strong Orlando but don't live in Orlando? Good news: you can view the whole collection here. You can follow Sam Flax of Orlando on Facebook, on Twitter and on Instagram. And if you live in Orlando, please shop there knowing they are a business that is devoted to helping their community. I want to thank Elizabeth Neeley of Sam Flax for all her help with this post. Thanks, Liz! 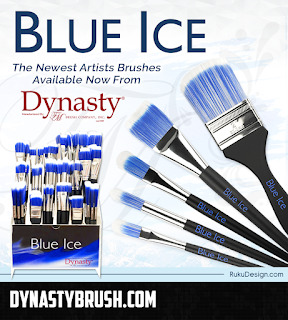 Blue Ice is the name of our newest line of artist brushes. Named after the strongest ice found on glaciers, Blue Ice is a workhorse that every painter needs in their studio. The bristles are soft, yet strong and come to a white chiseled point. The handles are crafted out of kiln dried white birch with a very modern matte black finish. The special blended synthetic bristles are durable and can easily manage the thickest heavy-bodied paints and media. This line of brushes can be used with acrylics, oils, chalk paints, and milk paints. I've actually used these brushes with latex paint for some home improvement projects and they have performed beautifully. These durable, easy to maintain, versatile brushes are becoming a favorite of our Dynasty Artists. Want to learn more Dynasty Blue Ice? Go to our website! And remember to follow us on Facebook, Twitter and Instagram.